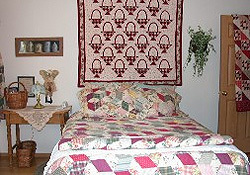 Welcome to Alaska's Lake Lucille Bed and Breakfast located in Wasilla only 50 miles from Anchorage. The mountain views are spectacular as is our beautiful Lake Lucille. 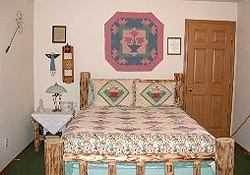 We offer first class lakeside accommodations for your comfort. Our large guest room are decorated with the natural beauty of Alaska wildlife and includes queen pine rustic beds and furniture. 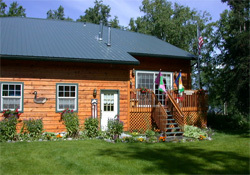 Alaska's Lake Lucille Bed and Breakfast is also located in the heart of the Mantanuska Susitna Valley. The perfect base for seeing many of Alaska wonders. Wasilla offers the convenience of a large community but with hometown beauty. 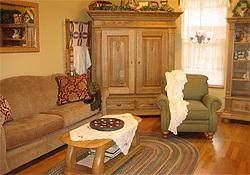 Alaska's Lake Lucille Bed and Breakfast in Wasilla, Alaska is the perfect Bed and Breakfast to visit and enjoy the beauty and wonders of Alaska at its best. We are here to help plan the perfect Alaska vacation. Looking forward to hearing from you. Call now to visit us very soon and our spectacular Alaska. In small sauce pan stir together sugar,cornstarch and cinnamon.Stir in apple juice. Cook over med. heat, stirring constantly,until hot,thick and bubbly. Remove from heat and stir in butter until melted. Makes about 1 1/3 cups. Can be made ahead refrigerated and warmed before serving.